Parkhotel Güldene Berge is the perfect place from which to embark on a tour of the many sights in the baroque town of Weißenfels and the Saale-Unstrut region. Schloss Neu-Augustusburg from the baroque period can be found in the historic town centre. The former residential palace of the counts of Saxony-Weißenfels features several exhibitions on the history of the duchy of Saxony-Weißenfels, the tradition of shoemaking and the region's past. The palace church, where famous composers such as Georg Friedrich Handel and Johann Sebastian Bach once played, is a sumptuous legacy of the former duchy. Just a few miles from Weißenfels is the oldest solar observatory in Europe. At the information centre in Schloss Goseck you can find out all about the 7,000-year-old cultural site. Another highlight on the Himmelswege or Sky Paths tourist route is the multimedia visitors' centre in Wangen, where the famous Sky Disc of Nebra was found. 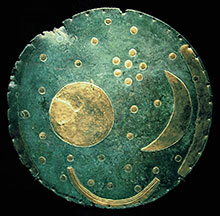 The disc, 3,600 years old, is on display at the State Museum of Prehistory in Halle. Famous people such as Friedrich von Hardenberg (Novalis), Friedrich Nietzsche, Gustav II, Adolf of Sweden, Heinrich Schütz and Johann Gottfried Seume have left their mark in and around Weißenfels. The world-famous cathedral in Naumburg with its cathedral treasure vault and figures of the cathedral founders attracts hundreds of thousands of visitors each year. The figures by the unknown Master of Naumburg have lost none of their sense of presence. The cathedral's Elisabeth Chapel also boasts a classic work of contemporary art. Artist Neo Rauch has designed three stained glass windows for the chapel which depict the life and work of St Elisabeth of Thuringia. We also offer you cycling trips, cultural walks and leisurely hikes in the Saale Valley. The trade fair centre of Leipzig with its zoo, Monument to the Battle of the Nations and St Thomas' Church is just 35 km (22 miles) away. Halle, Jena, town of the Classicists Weimar and the Bauhaus in Dessau are within a radius of 50 km (30 miles).